At the very end of the Baja California Peninsula, Cabo San Lucas is a modern resort that ticks all the boxes for nature lovers, active sports aficionados and beach bums. 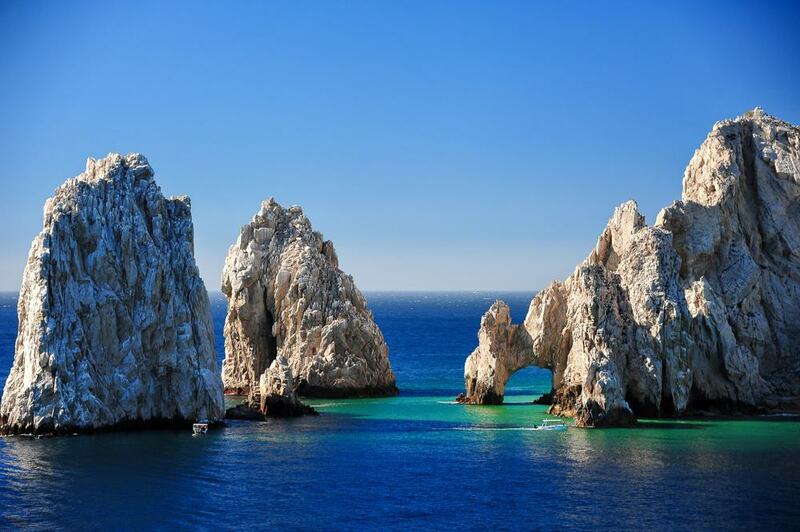 The postcard landmark in Cabo San Lucas is the Arco, a stirring natural arch in a group of tormented granite rock formations at Land’s End. There you can jump ashore and choose whether the blissful Playa del Amor or the raging Playa del Divorcio is the one for you. 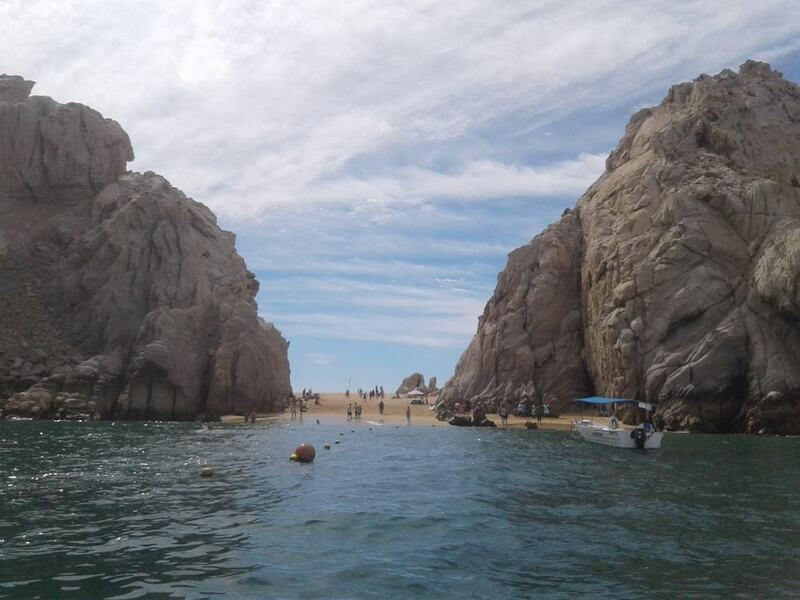 The underwater life in Cabo San Lucas is so rich you can take a safari just by wearing goggles to a beach, while on dry land there are championship golf courses and opportunities to race through the desert on high-speed buggies. If you take a water taxi you should be able to go ashore Playa Amor or Divorcio, depending on the currents on the day. Couched between the rocks on the north side of Land’s End is a sublime sheltered beach. You can reach it by boat and arrange to be picked up later, or, if you’re taking on Mount Solmar, you can scramble over the rocks to get there on land. 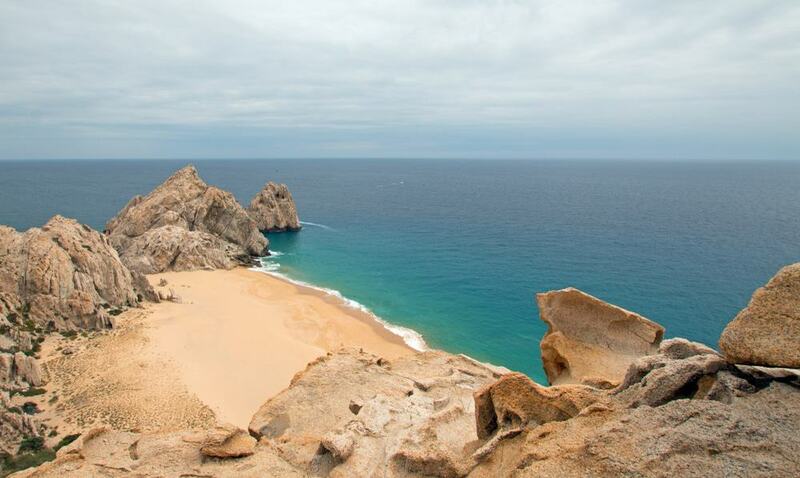 Playa del Amor has pristine and safe waters, without the heavy surf that buffet the Pacific side of the cape. Allow as long as possible to unwind on the golden sand, appreciate the stark beauty of the rock formations or go snorkelling to admire the puffer fish or rays from a distance. If you plan to spend more than an hour at Playa del Amor, remember to bring refreshments as there are only roaming vendors here. 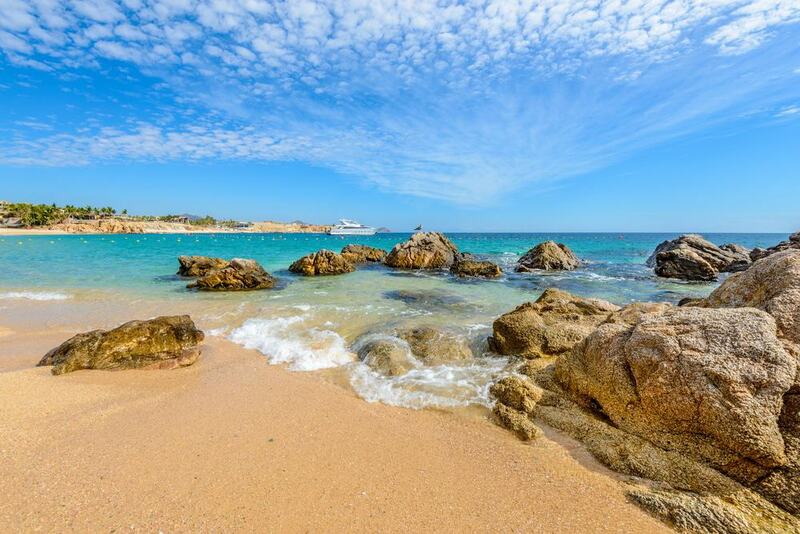 One of the favourite spots for diving expeditions, Santa Maria Bay is an exquisite public beach on a marine reserve, 12 kilometres from Cabo San Lucas. The bay is more like a cove, with coarse sand, tucked away from the Sea of Cortez and defended by two high rocks. The water is clear and gentle enough for snorkelling, and the multicoloured tropical fish aren’t shy . Until recently you had to take a dirt road to get down to the beach, but this has been replaced by a new car park. Facilities like bathrooms and showers have also been installed, so it’s never been more convenient to pass a few hours at this delightful beach. You’ll have to do a bit of research before starting this hike on Land’s End, as the trail-head is on private property (a dog shelter) next to the Mexican Navy base. The route is not signposted, but given that the goal is the highest summit on the cape, it will be easy to find your way. The climb looks forbidding but is surprisingly light, and the only real hazard comes from cactus spines. It will take an half an hour each way, but be sure to pack lots of water. There’s a cross marking the summit, and while you get your breath back you can look out at the ocean. 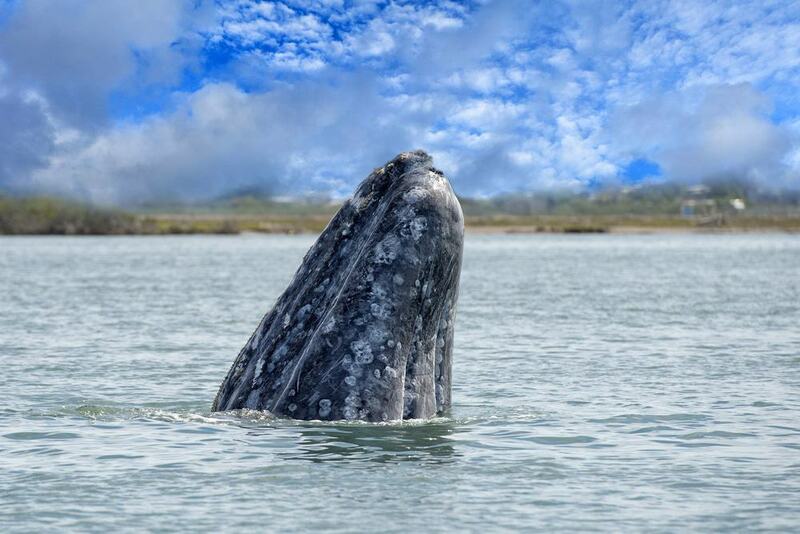 If you’re patient you may see a whale fin or tail between November and April, while the vistas back to Cabo San Lucas are also photo-worthy. Yet another unblemished public bay, Playa el Chileno is 15 kilometres east of Cabo San Lucas and one of the best beaches for snorkelling. Families adore Playa el Chileno for its tranquil surf, which is partly down to its eastern orientation, but also because there’s a rock reef that begins just offshore and continues for a few hundred metres out to sea. There are, however, lifeguards for extra peace of mind. Under the surface are sea urchins, live coral, rays and more than 15 species of tropical fish. Playa el Chileno also has clumps of low rock at each end where you can bathe in jacuzzi-like tidal pools. An apt name for a beach with tumultuous surf, Playa del Divorcio is skirted by those granite rocks on the south side of Land’s End. Swimming is prohibited at this beach, and it’s not hard to see why when you witness the waves crashing a couple of metres from the shore. 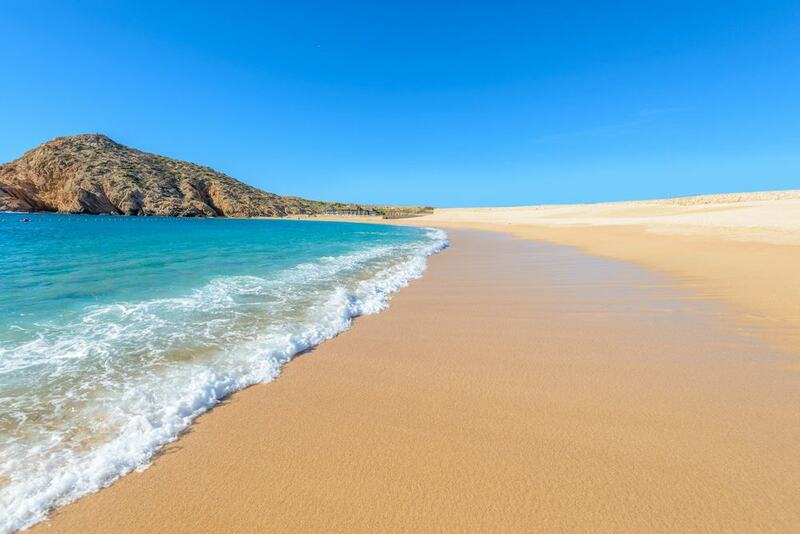 But for those who don’t intend to get wet, Playa del Divorcio has much more room than Playa del Amor to the north, and if you fix your gaze on the ocean you may see a flying ray or a whale breaching the surface. In the evening Playa del Divorcio is more idyllic that its name suggests, and is a fine place to watch the sunset with a loved one. You can also be strategic about how you view them. The best and most expensive way is to go on a private cruise on a small craft. That way you’ll get one-to-one insights from someone who knows these waters. It is worth trying to embark as early in the day as possible, when the whales are more active and the when the ocean is normally at its calmest. If you’re visiting Cabo San Lucas to venture beneath the waves, the best time to arrive is October or November. In these months visibility is high and water temperatures push 30°C, but conditions are superb right the way though to April. 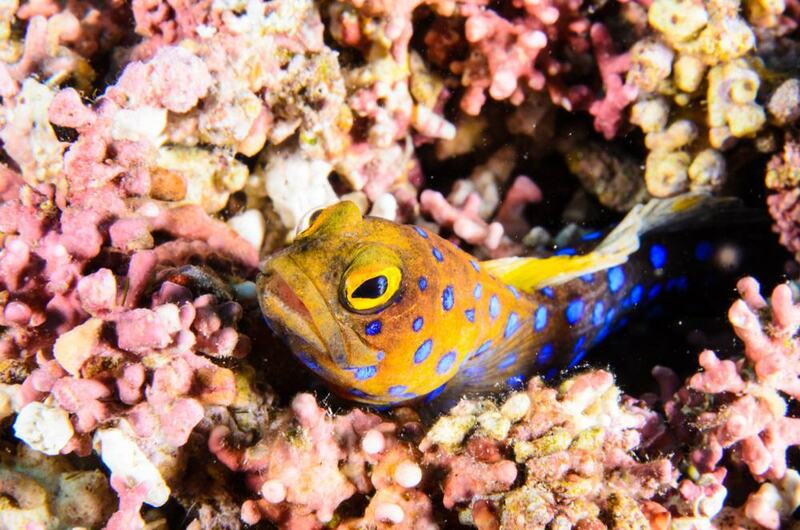 With the changing seasons there’s a different array of marine life beneath the waves, and some of the many species you might find are hammerhead sharks, white tip reef sharks, sea lions, groupers, mobula rays, manta rays and banded guitarfish. Whale sharks migrate to Baja Californian waters around October and operators like Cabo Adventures will drive you to locations like La Paz for the chance to dive and snorkel with the largest fish in the world. At a depth of 30 metres in the San Lucas Canyon you can witness the phenomenon of “sand falls”, caused by friction between the Pacific and North American tectonic plates. In downtown Cabo San Lucas, the Museo de Historia Natural goes into the natural history of Baja California Sur, studying its geology, anthropology and botany. There are skeltons of cetaceans, reptiles and birds, as well as the remains of a Pericú woman, an ethnic group that settled the lower end of the peninsula as early as 10,000 years ago. You can also find out about the measures being taken to preserve sea turtles and observe the migration patterns of dolphins and whales. The history section has a collection of navigation instruments, documenting maritime activity around Baja California Sur over the last 500 years. Having been raised in the 1970s, Cabo San Lucas isn’t flush with historical sites. But this church, at the site of an old mission, was standing in some form long before the first tourists showed up in Cabo San Lucas. 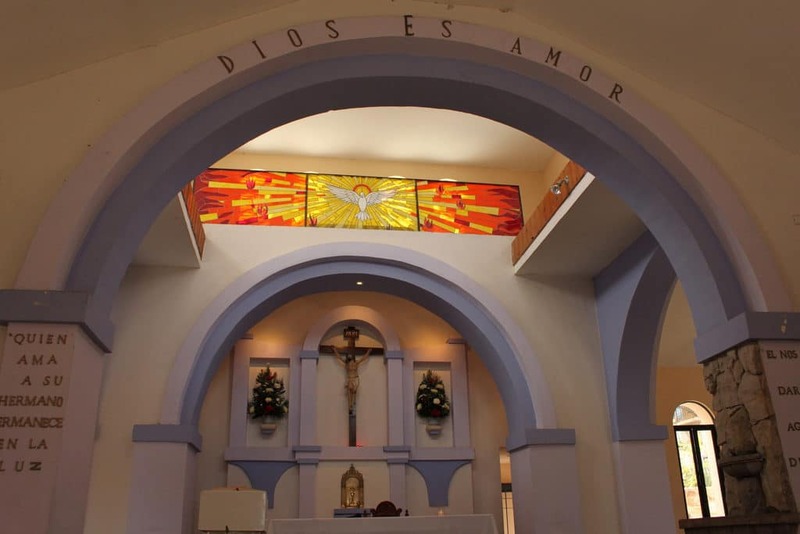 The mission was founded in 1730, and this simple building today has three rounded pediments and a single nave. There are bilingual services at noon on Sundays, and if you’re in town on Holy Week you can watch the procession to the nearby Plaza Amelia Wilkes on Palm Sunday, when the priest blesses the worshippers’ palm fronds. For something different you could make for the eastern foothills of the Sierra de la Laguna range in search of thermal springs for bathing. Two to keep in mind are El Chorro at the Village of Agua Caliente, and Santa Rita near San Jorge. 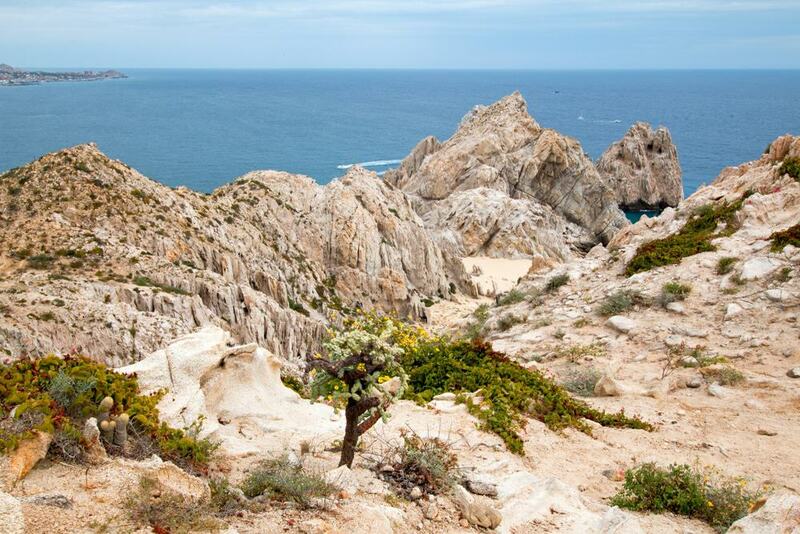 Both lie just over an hour north of Cabo San Lucas and are two of many that you could combine on a hike in an otherwise arid landscape. El Chorro may be the most scenic, with the glimmering spring embedded in a bowl of rock that has hot therapeutic water bubbling up from below and a waterfall splashing down. The Santa Rita Spring is an oasis-like rocky pool fringed by palms and other lush vegetation. There’s a feast of golf in store in Cabo San Lucas, with six destinations and a different course for every day of the week. One that grabs the headlines is the championship Cabo del Sol, which is often ranked among the top ten in Mexico. Cabo del Sol has both an Ocean and Desert course, designed by Jack Nicklaus and Tom Weiskopf respectively. Naturally you’ll expect to pay a little more for a premium round of golf and a green fee at peak times comes to $375 USD. But there are more affordable picks, like Cabo San Lucas Country Club, which is on a light slope over the Sea of Cortez and has an invigorating view of Land’s End. 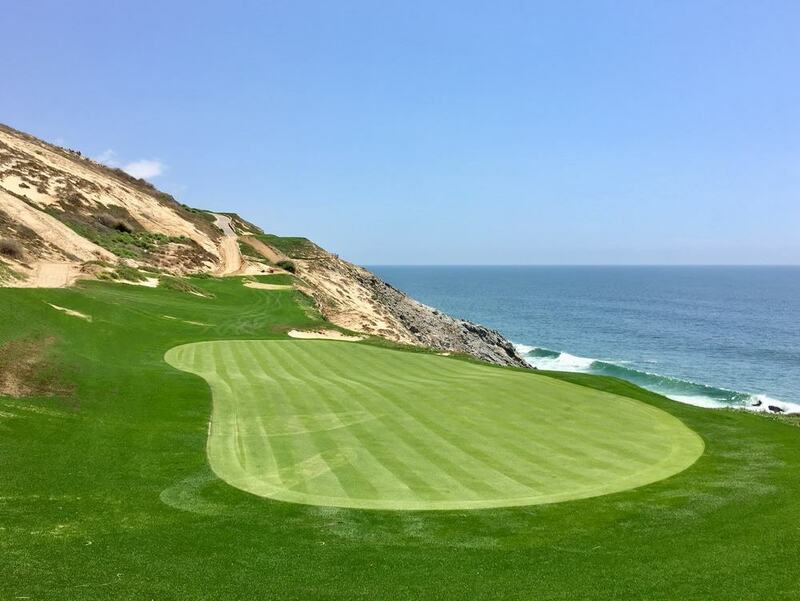 And for low-handicap golfers who have seen it all Cabo Real is another high-end 18-hole course, configured by Robert Trent Jones Jr. so that every hole has a sea view. 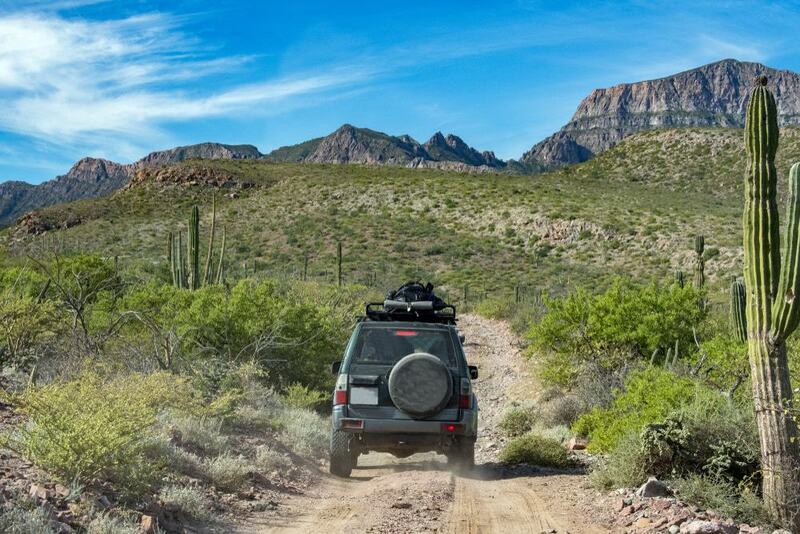 There’s a number of businesses (six in 2018) that provide Mad Max-style off-road trips into the Baja California Sur interior where you can pit your wits against sand dunes, cactus-coated hills and dry riverbeds. You could opt for a modified buggy, using a helmet radio to communicate with friends or your guide, or an ATV (quad bike). Most of the operators bring a photographer along to get some shots of you tearing through the desert. Some companies pick you up and drop you off at your accommodation, or allow you to make use of their centres for a much-needed shower and beer at the end of the adventure. 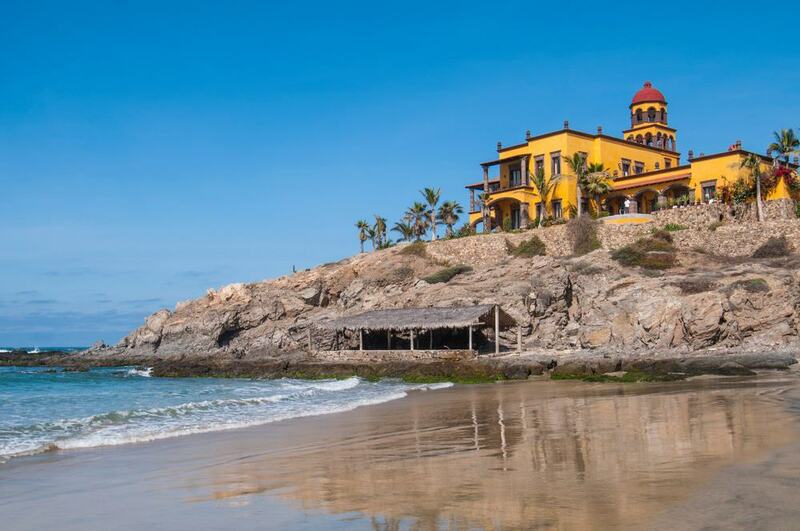 An hour up the west coast of Baja California Sur, Todos Santos is an adorable village, officially listed as one of Mexico’s “Pueblos Mágicos”. Centred on a square with wrought-iron lanterns and a bandstand are streets of single-story mansions, artist studios and galleries, with a restaurant and cafe every few strides. Todos Santos has beaches swept by the full force of the Pacific, which will be music to surfers’ ears. And from December to April you can visit Tortugueros las Playitas at sunset to help sea turtle hatchlings find their way to the ocean. It goes without saying that fish and seafood are on the menu in Cabo San Lucas. 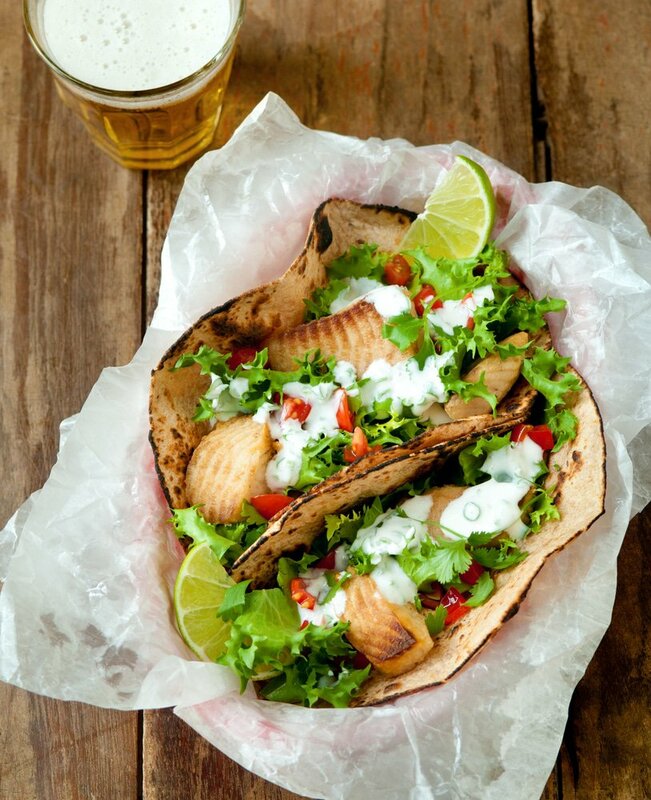 Fish tacos are big all over Mexico, but will be ocean fresh in Cabo San Lucas, and are deep fried white-fleshed fish like snapper topped with mango salsa or pico de gallo and a tangy sauce. Tacos also come with shrimp or octopus, while crab quesadillas and lobster burritos are delectable treats. A true Baja Californian speciality is almejas chocolatas (chocolate clams), in which this shellfish is roasted on a bed of sea pebbles under a fire of romerillo or Spanish needles. Also regional, tamales de güemes are sweet and savoury maize dough pockets filled with chicken, pork, olives and raisins.